This PDF 1.4 document has been generated by Microsoft Word - may2008pageone.doc / ÿþS c a n S o f t   P D F   C r e a t e !   , and has been sent on pdf-archive.com on 10/08/2017 at 22:22, from IP address 104.145.x.x. The current document download page has been viewed 264 times. File size: 911 KB (8 pages). Linda will be awarded the prize of $25 at the May meeting. Reburial of the coin cache will be done in the fall. acids need to be sealed tightly or they won't last long! Evamarie. Parents are Andi (Jan’s daughter) and Rick. Rick visited the club last November. have two daughters and four grandchildren. those who fill their holes shouldn’t have to be concerned. ears. I am not &quot;personally&quot; worried about getting a fine. holes that you are ignoring are giving us all a bad name. 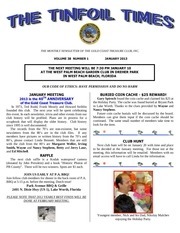 President of the West Palm Beach Coin Club for 25 years. birthday month, they each will receive a silver quarter! other refreshments for our meeting. Thank you!!! Beware of the beach cams that are becoming popular. not swinging a metal detector. The next day, Sweetie decided to sit at another spot. trip to the beach along with Betty and her detector. The Spiroch Family spent spring break on a cruise. not much was found except for a silver ring. quickly sold out. The lucky winner was Ken Lubinski. Now he can buy gas to drive home from the next meeting. coins goodbye at this setting also). out about 85% of rings and nickels you might have found. a lot of jewelry, haloed coins, coins on edge or at an angle. the exact number - or closest to it – will win $100! Wow! have been entered until the end of the contest. 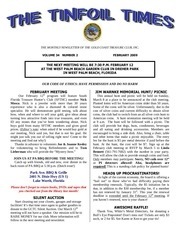 save the club money, please e-mail Linda. website before it is mailed.